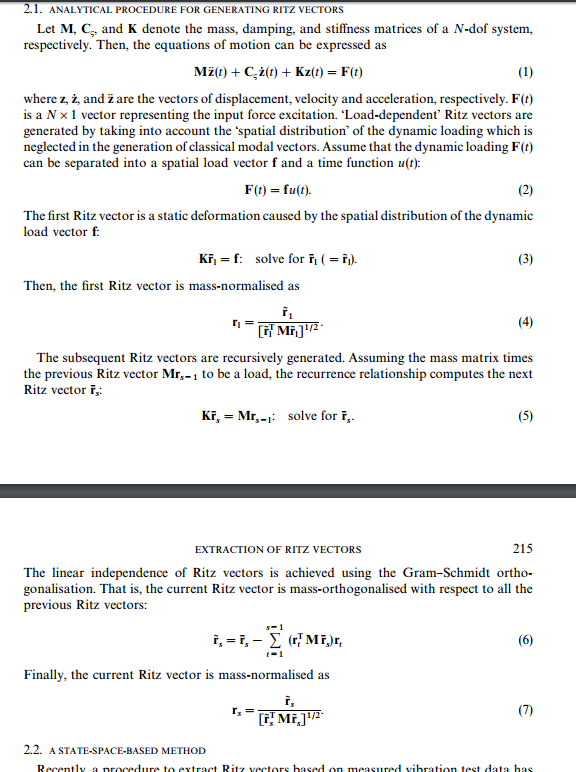 And I want to solve the equation for displacement $z(t)$, the eigenvalues and the eigenvectors with load dependent Ritz Analysis ( the algorithm is described succinctly in here). I know that I can use APRACK to for large scale eigenvalue problems, but what about load dependent Ritz Analysis? Is there already a solver ( commercial, open source, all doesn't matter) out there that does this kind of thing? Just to be clear, I am looking for a programming library that I can use, not a commercial software that I can't call programmatically . The algorithm described in your scan looks like it could be implemented using a library that can do the two things: 1) solution of a linear system (in particular, steps (3) and (5)) and 2) matrix-vector products (steps (4), (6) and (7)). This library could be, e.g., SciPy, cholmod, SuperLU, etc. depending on the properties of the matrix $K$. The commercial program, SAP 2000, http://www.comp-engineering.com/SAPManE.htm has an option for dynamic analysis with Ritz vectors. Take a look at page 74 in the Basic Analysis Reference Manual. Not the answer you're looking for? Browse other questions tagged numerical-analysis eigensystem or ask your own question. Computing eigenpairs of singular matrix with ZGEEV?